﻿ FLV to iMovie - How to Import Flash Video, FLV to iMovie '11, '09, '08? Home » video » How to Import FLV to iMovie '11, '09, '08? How to Import FLV to iMovie '11, '09, '08? As one of the Flash Video file format, FLV has been accepted as the default online video format by many sites including YouTube, Hulu, VEVO, Yahoo! Video, metacafe, Reuters.com, and many other news providers. Editing FLV video file also becomes more and more popular all over the world. However, the widely used iMovie video editing software failed to import FLV movies no matter it is in the version 08, 09 or 11. What if to edit FLV in iMovie? Is there no way to import flash to iMovie, import FLV into iMovie? The following article will solve this headache problem, it is dead easy! 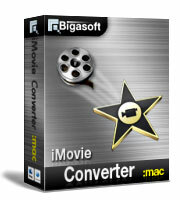 Free download the ideal FLV to iMovie Converter - Bigasoft iMovie Converter for Mac, install and run it, the following interface will pop up. Press "Add File" button to add Flash video FLV file. 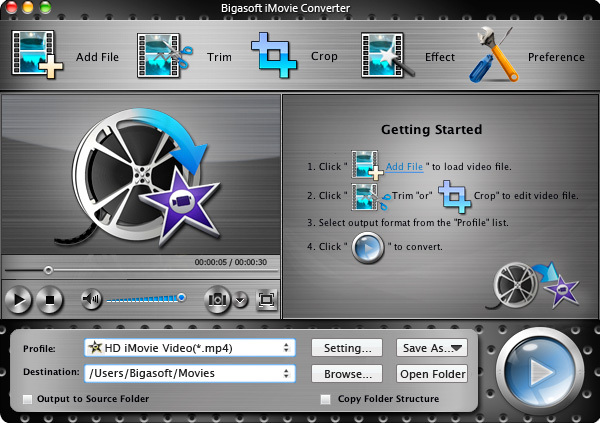 Or you can also drag FLV file directly to the main interface of Bigasoft iMovie Converter for Mac. Click the drop-down button on the right side of the "Profile" button to select iMovie Video MPEG-4(*.mp4) as output format. 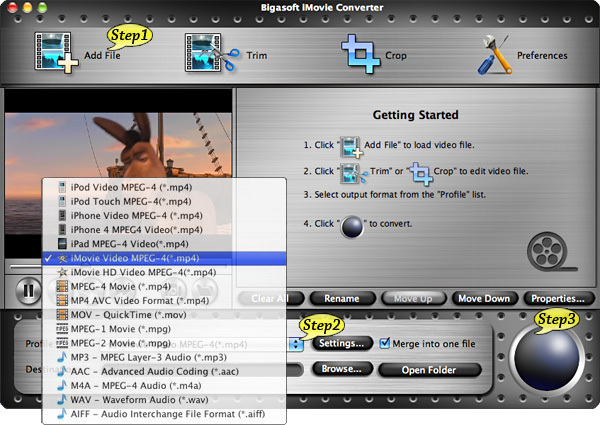 Click "Convert" button to begin the FLV to iMovie video format conversion. It will be finished with high output quality and fast converting speed. First start iMovie, then choose File > Import > Movies..., and then navigate to the folder where your converted FLV file is located, finally select (highlight) the converted FLV file, create a new event and click "Import" button. It is just easy to edit FLV in iMovie '11/'09/'08 with this powerful FLV to iMovie Converter! Wait no more, just free download it and have a try!